When I first heard the concept of overdiagnosis my initial thoughts were that surely such a concept couldn’t exist: either the diagnosis is correct or it’s incorrect. The second overdiagnosis conference, organized by CEBM in Sep 2014, and held in Oxford, offered insight into the range of diagnosis and diseases affected by overdiagnosis and the extent of the problem. In terms of cancer, there seems to be issues in all of the major diseases: ovarian, cervical, breast, prostate and thyroid all formed part of the presentations and discussions. Some of these issues, such as overdiagnosis in breast screening are more prominent and have led to significant policy changes. In 2009, the US Preventive Services Task Force created controversy by suggesting that fewer screening tests be done and in the UK, policy now requires women to be given more information about the potential harm of being tested. 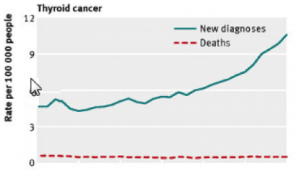 Some areas, such as overdiagnosis in thyroid cancer were new to me. 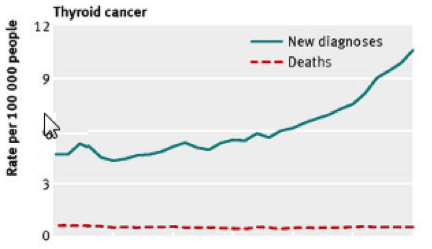 A 2012 BMJ paper on how to stop harming the healthy provides a useful visual understanding: whilst the incidence of thyroid cancer continues to rise no benefits are observed in terms of the hard outcome – death. Additionally, I now have a grasp of a new term that underpins a lot of the growth in overdiagnosis found by of imaging – I had to look it up check the spelling – the Incidentaloma: a tumour detected incidentally without symptoms or suspicion. Although articles go as far back as 1990, describing the phenomenon, it is the recent rise in super sensitive scanners and the increasing number of scans driving the increase. As an example, at autopsy, an adrenal mass occurs in 3% of over 50s, but only about 1 in 4000 is malignant. What to do in the face of an incidentaloma then becomes a major issue. The evidence base often lacks studies on incidence, prevalence, and the natural history, and all sorts of important clinical issues, such has when to monitor arise. In an evidence void, where trials are too short and rely heavily on surrogates, as a consequence repeat testing – for all sorts of diseases – occurs too often and too early. As Margaret McCartney, one of the keynote speakers and a GP stated: ‘we can do better’.